Timeless residence offers privacy and views on a 5 Acre estate with unobstructed panoramic views. This hillside Estate mixes natural landscape with sculpture gardens, covered patios and resort quality pool/spa. Features include 2 Master Suites, 1 EnSuite Bedroom plus Administrative and Exec Offices. Outdoor amenities include a Spa, Negative Edge Pool with Swim-Up Bar, Roaring Fireplace, Outdoor Kitchen and more. Behind its own private gate, the privileged owner of this extraordinary home will possess a unique level of privacy and seclusion rarely found, especially when considering the area's best fine dining, shopping, and entertainment are within 15 minutes drive, and both the Phoenix Sky Harbor International and Scottsdale Airports are only 20 minutes away. 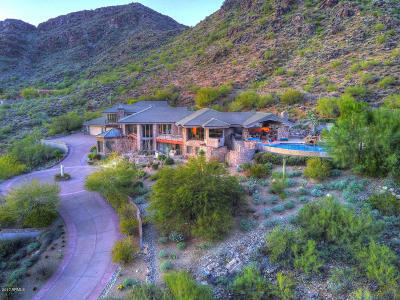 Enjoy Panoramic views of the Valley from this location that sits nestled in Mummy Mountain. Comfortably surrounded by architectural masterpieces, the skyline and cascading mountain ranges provide extraordinary privacy and tranquility. Location on mountain is such that views can never be built out â“ these views are forever!